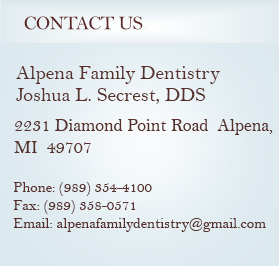 We proudly provide quality dental care to the community of Alpena, Michigan and the surrounding areas. Our office specializes in general and cosmetic dentistry for the entire family. 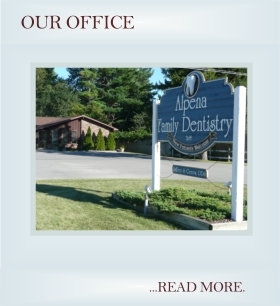 We strive to make our office a comfortable, caring environment devoted to serving our patients with the personalized and quality care they deserve from an Alpena Dentist. Alpena Family Dentistry is committed to restoring and enhancing the natural beauty of every smile. Every treatment plan will be fully explained, every question answered, and every treatment option will be tailored to fit your individual needs and time schedule. Our goal is to help our patients achieve and maintain a healthy and attractive smile. "We look forward to hearing from you and will do our best to answer any questions you may have." "They have a (...) staff that's very knowledgeable and qualified. (...) I was impressed with their professionalism. They put in the extra effort to make me feel valued and important. They never left me for an extended period of time and I never felt ignored."